Thick and rich, with a texture remarkably like its dairy counterpart, this mock chocolate pudding is sure to please. Unlike the dairy version, however, this contains no sugar, no cornstarch, and no cholesterol. How about a second serving? 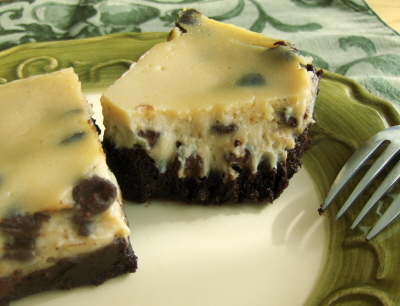 A cheesecake topping over rich, fudgy brownie base. . . I’ll take 101 of these, please. A delectably chewy, fudgy chocolate-mint cookie studded with dairy-free chocolate chips. Easy to mix together, these cookies can be made with fresh mint or mint extract. This is the perfect special-occasion or birthday party cake: made with spelt flour and sweetened with maple syrup, it’s light, deeply chocolate, with a creamy vanilla filling between the layers and a rich, pipe-able and fudgy sugar-free frosting spread generously over the sides and top. Your guests will marvel that the cake is free of eggs, dairy, refined sugars, and wheat!